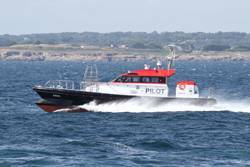 On May 3, 2012, Fresena, an 18 meter pilot boat will be delivered to Lotsenversetzboote Technische Fachstelle Nordwest pilots. After delivery, this unit is the second in a series of 4 vessels for German pilots. Marc Bernard, technical director of the Beranrd shipyard says: "The prototype of the pilot boat named Frya has been operating for almost a year in the area of Borkum from the port of Emden. It has proven highly satisfactory in particular on its behavior at sea in rough weather. We are pleased to deliver her sister ship after confirming a series of tests: a maximum speed exceeding 30 knots, a noise level below 75 decibels in the wheelhouse and many technical innovations including the warming bridge and handrail tailored to work in northern Germany in extreme cold. A third vessel named "Burkana" will be delivered in September to Borckum before a fourth vessel to the pilotage station of Bremerhaven. " Designed and built in the shipyard BERNARD at Locmiquelic, near Lorient in Brittany, this concept of an “all weather” craft allows for a vessel which meets the stringent requirements of the pilot stations in the ports of Northern Europe.